Anyone who’s been to the practice range knows how difficult it is to make a perfect shot which lands neatly where you want it to be. There are just so many natural factors which get in the way of a good shot. But there’s one thing you can improve on though – your swing. Take note that a good swing necessarily means that you have to hit the ball every time; a lot of golfers believe they’re in the zone since they’re batting 100%, while all they were actually doing is whacking the balls into random spots. All good shots rely on the swing, at least in part. If you want to improve your swing, concentrate on it, and not on your batting average. Here are the basics on how to do it. If you think that you can teach yourself how to swing without lessons, you’ll waste time on the range learning a technique which is common knowledge to those who know better. Chances are, what you think and what you do are different things, especially with golf. It would be to your advantage to observe a step-by-step guide which walks you through all the elements of a good swing, explained in a way which is easy to understand. There are many golf guides out there with differing ideas on how a good swing should look and feel like, but at least you’ll be able to sort them out and find which method works best for you. It’s obviously better than spending the day hitting dirt and learning practically nothing. Golf instructors will all tell you that your grip on the club has a significant effect on your swing; if both your hands are not poised on the handle at a neutral position, you are actually exerting more effort and complicating your swing. If you’re grip is loose, shots will spin either way. It is important to focus on your grip so as to zero in on the reason for your loose shots. Most of the time, learning how to grip results in a vast improvement; otherwise, at least you can now focus on your body arc. You have to align yourself squarely to the point where you want the ball to go. If your stance is off and you make a great shot, it would be worthless since the ball’s direction would be off, no matter how far it goes. 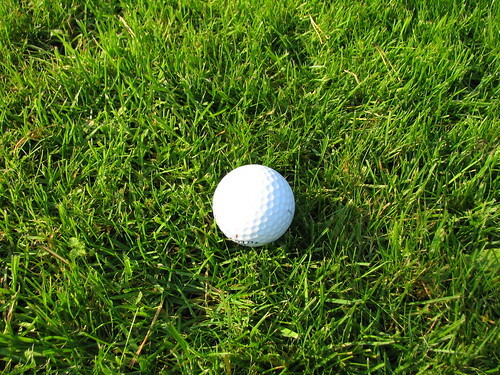 To determine if you are aligned squarely to the intended drop point, lay a club with an end pointed directly at the target, and put another club which runs parallel to it, about a foot away. Take the first club and use it to hit balls at the same spot, keeping both your feet parallel to the other club. From hereon, its all about practice; your swing is as individual as your fingerprint, and what works for most may not work for you. Spend plenty of time in front of the mirror doing swings (not whacking balls); you’ll find your ideal swing in less time if you shift your concentration from the ball to your body arc.